Exciting 80s buddy cop movie, but this is far from Lethal Weapon. Filmed the Hong Kong way, this plays hard and fast with wild set pieces and gawping stunt work. 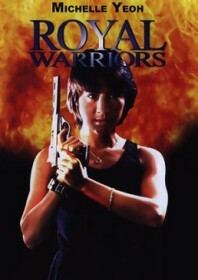 Yeoh, in her second leading role for D&B Films, reprises her fearless by-the-book police officer from Police Assassins, forming part of a brave trio of cops who apprehend a mid-air hijacking on board a passenger jet. Michael Wong plays her smitten Romeo – a sweet comedic ploy – and Sanada plays a Japanese family man on the brink of retiring and returning home. The war buddies of the crooks killed on the plane seek revenge, so they strap a bomb to the Sanada family car and kill his wife and child. Yeoh is tasked with either choosing her career or helping the men who depend on her. Apart from the twee and ubiquitous synthesizers, the film is headstrong, edgy and relentless fun. It’s the sort of film where Michelle Yeoh commandeers a metallic battling ram to rescue a coffin suspended from a crane in an abandoned quarry and is summarily attacked by a man with a chainsaw. So if you like that sort of thing, jump on board.